Fulham head coach Slavisa Jokanovic has revealed negotiations over the job went on for several weeks. The 47-year-old Serb was appointed by the west London club on Sunday, replacing Kit Symons, who was sacked as manager on 8 November. "We talked a few weeks and it was a long process. I believe I was the first choice for the club and they pushed hard to bring me here," said Jokanovic. "It is a great chance for me to work at a historical club." Fulham held talks with then Reading boss Steve Clarke in mid-November about taking over from Symons, but chairman Shahid Khan said the club "had an obligation to fully explore our options" and were interested in Jokanovic "from the start". 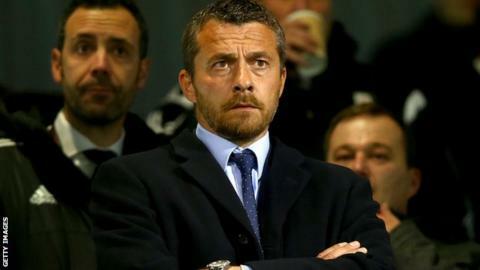 The Championship club have paid Israeli side Maccabi Tel Aviv £367,000 compensation for Jokanovic's services and the former Watford boss will be joined at Craven Cottage by coaches Alberto Escobar and Javi Pereira. Jokanovic expects Stuart Gray, who had been in charge of the Whites since 8 December, to remain in his role of senior coach at the club. "Stuart has tried to give me all the information and I need help from him," he said. "I expect in the future we will collaborate better. "We are both here in the interests of Fulham and I believe we can work together to do a quality job." Jokanovic watched from the stands as his new side beat Rotherham 4-1 at home on Tuesday night to record their first win in 10 games and move up to 18th in the table. The former Chelsea midfielder won promotion to the Premier League with Watford last season, but he has not yet set himself goals for the rest of the campaign. "My job is clear and people expect me to improve the team and fight for more important targets," he said. "After some weeks and months our targets will be clear. We need to take short steps. "I believe in myself, the club and the people. I am ready for the challenge." Jokanovic will take charge of Fulham for the first time on Saturday, when they host Sheffield Wednesday.